The Sunday Stamps meme over at Viridian's Postcard Blog this week is taking a look at flag stamps or patriotic stamps. 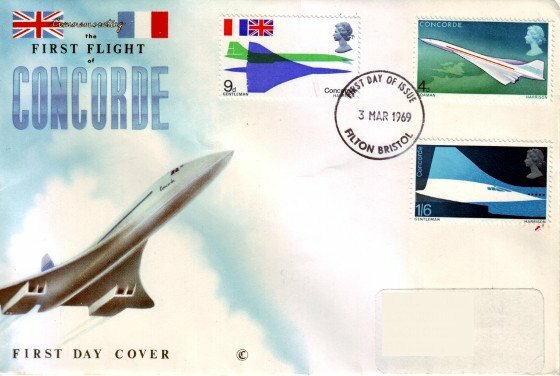 This first day cover commemorating the First Flight of Concorde came to my mind as a great example. It features both the British Union Flag and the French Tricolour and celebrates the combined efforts of British and French engineering through the work of the British Aircraft Corporation and Aérospatiale after a Franco-British government treaty to produce this iconic aircraft. Two prototype Concordes – 001 and 002 – were constructed, with the French Concorde 001 making its first test flight from Toulouse on 2 March, 1969, with the British Concorde 002 making its own maiden test flight from Filton Aerodrome on 9 April 1969. These stamps were issued by the General Post Office on 3 March, 1969 and are postmarked “Filton Bristol”. I grew up in the South West of England and hearing the sound of the supersonic aircraft's sonic boom as it broke the sound barrier is something I remember very well from my childhood. Later, whilst a student at Reading University, I would often find myself directly under its flight path – looking up and watching that extraordinarily elegant plane flying overhead always filled me with awe. Sadly, Concorde was retired for good in 2003, its demise surely hastened by the tragic Air France crash in Gonesse in 2000. Concorde remains one of the most well-loved planes to have ever flown, however, so much so that it won top ranking in the Great British Design Quest organised by the BBC and the Design Museum in 2006. The stamps featured are: 4d - Concorde in Flight, designed by Michael Goaman, with the 9d Plan and Elevation Views and 1s6d Concorde's Nose and Tail both designed by David Gentleman. I especially like the 4d stamp. My cousin lives near Reading and says she still misses that daily sight of the Concorde flying overhead. I have the 4d stamp. Concorde once flew into Teesside Airport; it cam low over our house. The noise was tremendous and the whole house shook. There will never be another plane like it. I never got to see or hear the Concorde. What a romantic plane – for those of us who did not have to put up with the sonic booms. Great stamps too. It mas a most beautifully designed aeroplane, the stamps capture that shape of cutting edge technology. Just think the most recent French/Britain stamp was of people stood in a tunnel, not quite the same romance although very practical.